Technology is growing at an ever-increasing rate. While this is awesome and means that there will be a lot of advances in medicine, clean energy, and farming, it also means that it’s hard to keep up with all the toys, gizmos and gadgets. Crazy as it may seem, not everyone wants to throw away all of their electronics every year and buy the newest thing on the market. 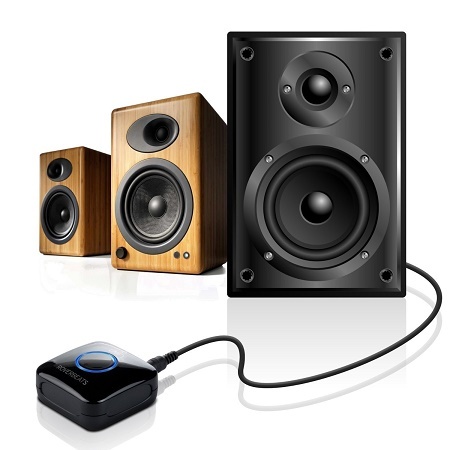 If you fall under that category and are still enjoying your old speakers that don’t connect via Bluetooth, but sometimes wish that they did, the Etekcity Bluetooth Receiver will make what is old feel like almost brand new. This gives you up to 10 hours of 4.0 Bluetooth streaming on a full charge with a range of 33 feet. You’ll be able to use this for your home theater system, car stereo, or just your normal speakers for your TV or computer. This easily adapts through A/V, RCA, and a 3.5mm jack. It was made to be portable so it can make any speaker system you come across Bluetooth compatible. The charge time to get it to full is around 2 hours, but thankfully you can use it while it’s plugged in. Obviously though, that will increase the charging time. You’ll be looking at paying out around $19 for this little device, but that is vastly better than paying for a brand new speaker system for all of your various devices.